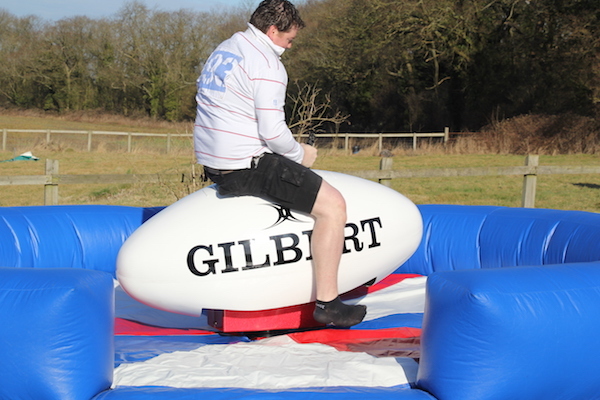 No need to be a budding Jonny Wilkinson to enjoy this exhilarating ride and there are no skills or tries required for this fabulous rugby game! 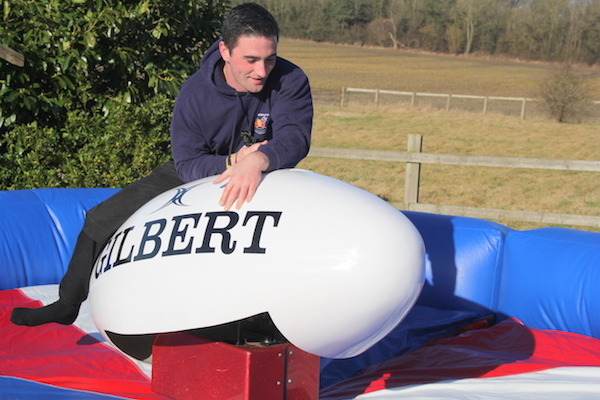 Fun and competitive, the Rodeo Rugby Ball Ride is great fun for both riders and spectators. It is a super centre piece for any event. 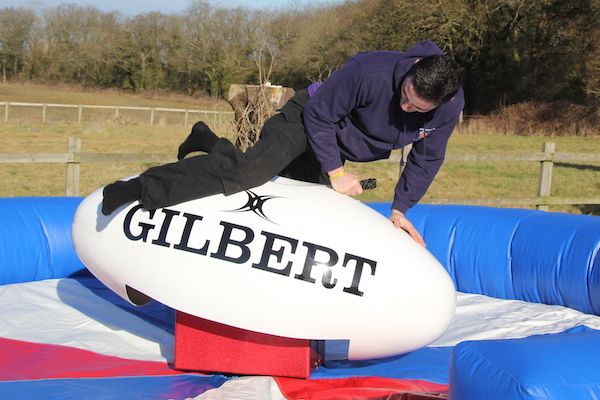 Whether it is your team mates, work colleagues or family and friends cheering you on, everyone will enjoy the challenge of seeing how long they can ride this giant rugby ball. 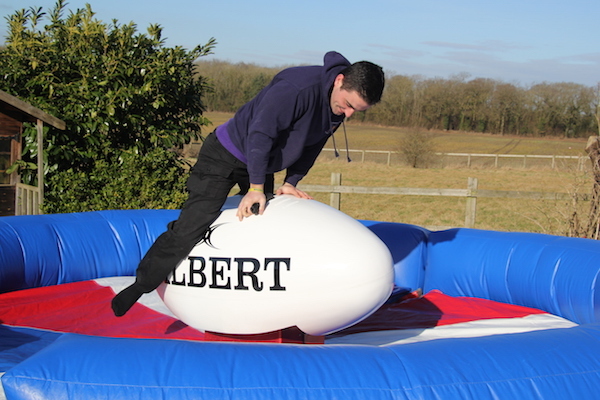 We can assure you it’s harder than it looks! 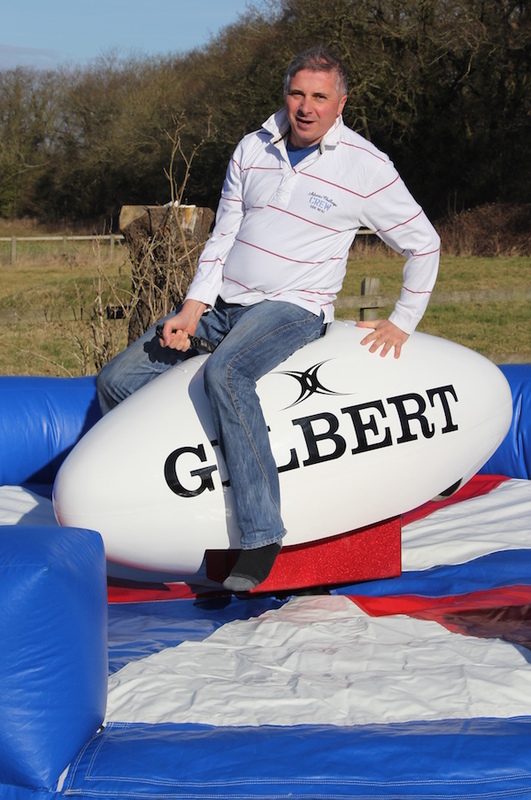 Whilst perfect for pre-match entertainment, the Rodeo Rugby Ball Ride is a fantastic hire addition at any event. 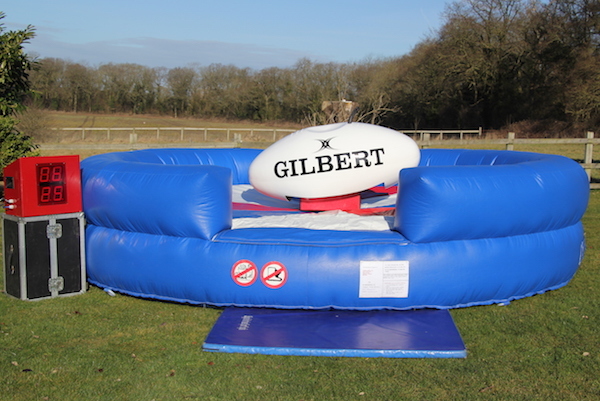 So if you are organising a family fun day, corporate event, summer party, birthday party or a fun gathering of family and friends, the Rodeo Rugby Ball will ensure your guests have a fantastic time. Our trained operator will organise a competition and find the best Rodeo Rugby Ball rider at your event. 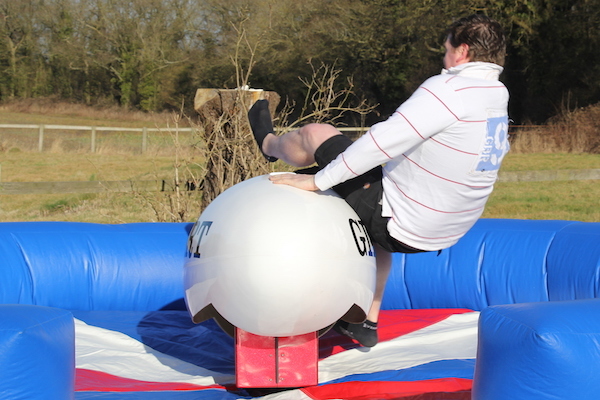 We supply appropriate prizes. 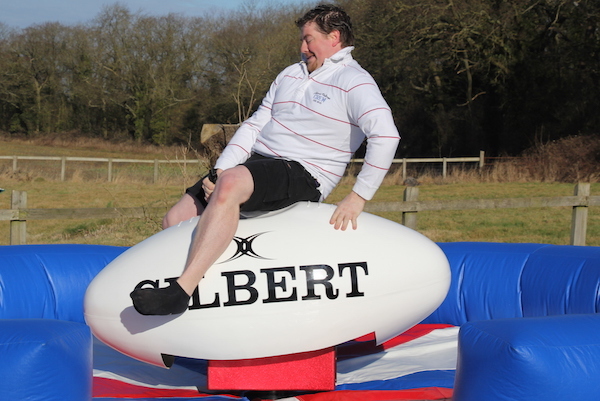 Our Rodeo Rugby Ball has 2 timers – 1 records the current ride time and the other one shows the best time at your event. 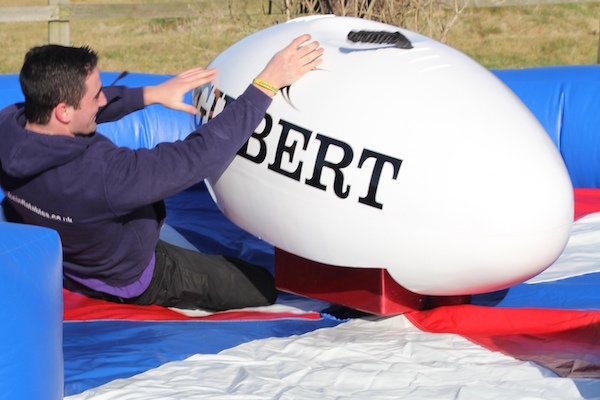 A red, white and blue inflatable bed is normally supplied unless you would prefer a western themed bed. A rain shelter/marquee is available if required. 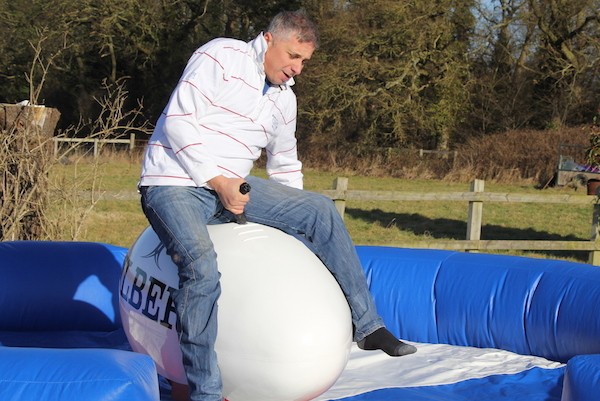 We are able to supply Rodeo Rugby Balls to all areas in the UK including Evesham, Worcestershire, Gloucestershire, Herefordshire, Warwickshire, Shropshire, West Midlands, Staffordshire, Leicestershire, Oxfordshire, Wiltshire and Somerset. 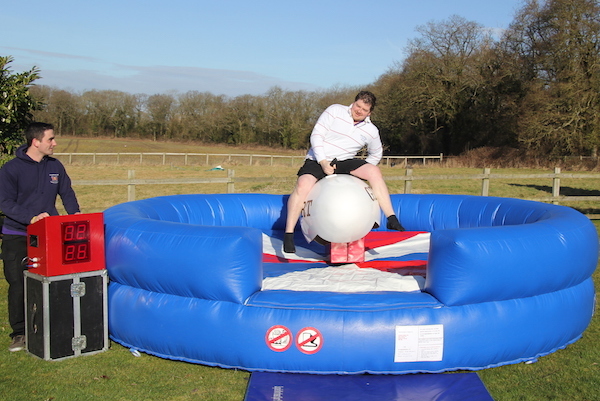 Towns in and around Worcester include Evesham, Worcester, Pershore, Malvern, Upton upon Severn, Gloucester, Cheltenham, Stratford, Broadway, Bidford, Alcester, Inkberrow, Hartlebury, Kidderminster, Stourport on Severn, Studley, Hanbury, Colwall, Tewkesbury, Bromsgrove, Droitwich, Stratford upon Avon and Bredon.